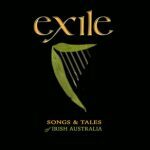 The live recording of ‘Exile: Songs & Tales of Irish Australia’ is now available for purchase as a CD/DVD set. Ireland’s greatest export has been her people and for centuries, emigration and exile have been harsh, repeating themes of Irish history. An astounding line-up of artists from Ireland and Australia, including Paul Kelly, Shane Howard, Pauline Scanlon, Leah Flanagan, Declan O’Rourke and more, gather in a moving celebration of Irish impact on Australian life. Through abundant literature, music, poetry and art, as well as a keen hunger for sport and justice, the Irish spirit has stamped itself on the evolving culture of Australia. 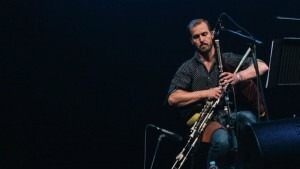 Pipes player Nick Martin, Exile Concert, Brisbane, February 2016. Photograph by Benjamin Knight. Almost a third of all Australians claim some degree of Irish descent and many Aboriginal Australians are also proud of their Irish ancestry. The enduring influence on Australian history, music and politics is recounted through rich imagery and stirring performances in this special concert event. The most cataclysmic event of Irish history, An Gorta Mor, The Great Hunger, between 1846 and 1850, saw more than a million people die of starvation and disease and just as many flee in utter desperation, on boats to America, Australia, Canada and New Zealand. There is no denying the contribution that the Irish have made to Australian life. It’s certainly varied but rarely dull. ‘Exile’ features specially commissioned documentary visuals by Wind & Sky Productions which are an integral part of the live experience in the show.